Evidence that a complete head transplant is possible. Wow. Just wow. Live near DC? Be sure to check out the sky at 10:11 pm tonight. Friday evening, June 21st, the International Space Station will fly high above the National Capital area, very likely becoming the brightest object in the sky, except the Moon. Weather permitting, the space station should be easily seen using just the naked eye. Even if numerous clouds are present, the station is now so bright that she can be dramatic between clouds, or behind light cloud. ISS will rise between the WNW and the northwest about 10:11 pm EDT, moving up and slightly to the left. About 4 minutes later, very high in the southwest, she will culminate at about 68 degrees over azimuth 219. About 2 seconds later, ISS will pass about 1 degree above the very bright star, Arcturus, alpha Bootis. About 42 seconds later, she will pass about 20 degrees above the Moon in the SSE, being about 47 degrees altitude above azimuth 157 degrees. About 14 seconds later, ISS will disappear into the shadow of the Earth, being about 40 degrees above 151 degrees. It is not possible to give the exact time of the passage, but there is an excellent chance that these times are within just a very few minutes of the actual flyover. ISS will appear as a bright moving point, perhaps similar in appearance to a distant airliner. Very distant, as she will come no closer than 279 miles, and will be moving 5 miles per second. Credit is due to the Flight Dynamics Office of the Johnson Space Center for supplying data used in producing these indications of visibility. I love a good sci-fi. Novel, movie, B-rated TV show, you name it, I love ’em all. But sometimes our imaginations can’t hold a candle to our own planet’s. Good ol’ Mother Earth got her freak on with these babies. The Yangtze giant softshell turtle. With only a handful of their species left, these bad boys are on the outs (MotherNatureNetwork). Bummer, ’cause turtle soup is awesome. The human-faced carp, found off the coast of South Korea (The Telegraph). The star-nosed mole (Animal Diversity). I’m just gonna say it. He’s got a sphincter on his face. Japanese spider crab. The clip below is awesome, both for the nightmare-inducing content and the equally horrifying techno music. Sometimes I surf Google for fun science facts. Here are a few of my favorite weather mindbenders, in honor of our continuous descent into unpredictability. – The largest snowflake on record was 15 inches wide and 7.8 inches thick…it fell from the Montana sky in 1887 (Climate&Weather). Seriously, 125 years ago someone ran around during a snowstorm brandishing a ruler. 1) The analog clock. Not kidding. Just wait…schools will stop teaching the minute & second hands curriculum in the not-too-distant future. Why bother when elementary school kids are carrying around cell phones? 2) Incandescent light bulbs. Just this past year the government was debating banning the sale or manufacture…regardless of the date, I’m thinking this baby’s time is running out. No more burning our fingers, but dudes, what will we show our kids when they ask what Thomas Edison did? 3) Home phones. Dunno about you, but I already have plenty of friends who don’t bother with the standard landline. 4) Paper books. Authors & publishers alike either see the writing on the wall when they check e-book sales, or are hiding under their blankets with flashlights. 5) Cursive. 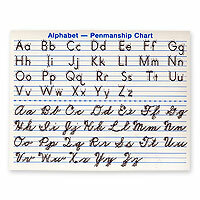 Remember all those tedious hours in grade school learning penmanship? Good news for your kids…they’ll now be learning keyboarding. You might have to translate Aunt Ruth’s birthday card, though. 6) Paper maps. These may be around a bit longer than the other items on this list, but eventually, GPS and internet-printed directions will dominate. 7) The Post Office. 2000 offices already closed, and certainly more in the future. Private shipping agencies and online access to forms, bills, etc are drastically cutting into our need for snail mail. 8) Checkbooks. They’re less secure, less convenient, and more expensive than cards or electronic payments. 9) Cash registers. Don’t laugh…as self-checkout and electronic payments become more popular, cashiers can start looking for work elsewhere. 10) College textbooks. Books make this list twice, if only because of our generation’s permanent back problems. Remember paying $160 for your Economics book? You’ll still have to pay for downloads, but at least you won’t have to carry a 60-lb. backpack across campus.